When I was a little girl I loved reading the “Little House” books by Laura Ingalls Wilder. I think that is where it actually began. 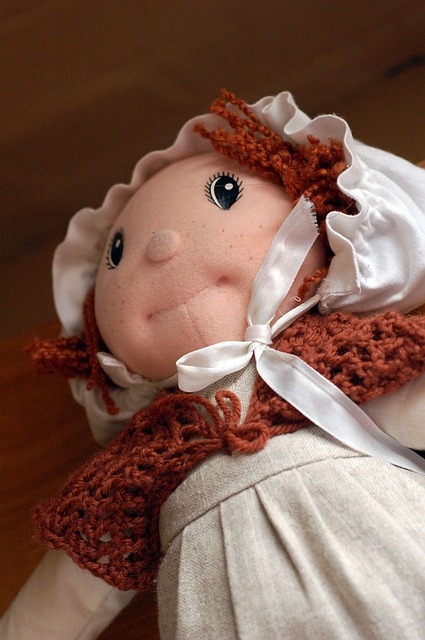 She described the rag doll that Ma made her for Christmas in The Little House in the Big Woods. I’m pretty sure she had knitted garters and stockings. Sewing, cooking and knitting occurred in various degrees in all the books. My mother taught me to sew and cook. I wanted to learn to knit and crochet like a well-rounded Victorian little girl. My mother didn’t know how to work with yarn. She tried to get me in a class at the local yarn purveyor, but they didn’t want to teach a child. I eventually got in a class at the local creative arts center. You wouldn’t expect it to become that important, but in a way my life has been a steady stream of yarn knitted into a whole. I’m not sure I remember everything that I have knit. I was taught to knit a rectangle that was made into a simple slipper. One was so badly done as to be unwearable. Somewhere in that second slipper my fingers learned the process. It quickly worked it’s was into muscle memory and my hands know how to knit and pearl without looking, or even much thinking about what I am doing. Knitting has become ingrained into me. I find knitting very relaxing. Some people talk about running and reaching a state of peace and pleasure from the experience. I think they call it a, “runners high.” For me that is the feel of the yarn flowing through my hand and the twists and turns of my hands. The extra blessing of knitting is that useful garments ooze out of the process. I bore easily, so I always knit something new each time. One year I made all my friends mufflers for Christmas. I began in June. The interesting part is that each scarf was different. A different pattern and new type of yarn. It was a fun way to experiment with novelty yarns. When I don’t have a project on my needles I feel like something is missing. Honestly, I find myself looking at my knitting basket, then remembering I don’t have anything to knit, and feeling empty. I knit continental. The fact that I always have the working yarn running toward the needles makes me a fast knitter. My fingers start to fly as soon as I start to learn the pattern. Being a fast knitter means that I run out of projects ready too quickly. I just knit a new fall hat last month. I bought two balls of a merino-silk worsted weight blend. I knew I probably needed only one ball, but it would be close and I buy most of my yarn mail-order. Now I have a finished hat and a second untouched ball. I thought about mitts and looked through my patterns, but nothing really spoke to me. I already have a matching caplet I knit a few years ago. The merino-silk blend has a wonderful feel as it slide through my fingers. I think it is the feel of the yarn that I find most pleasurable in knitting. I don’t like knitting rough or synthetic yarn. Wool is my favorite due to it’s stretch. Fighting my yarn is not enjoyable. The absolute most important feature of yarn is the idea of one long continuous piece of fiber. 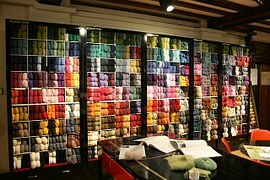 The concept represented in knitting is the best characteristic. If there were no other reason to knit I would knit to remind myself that it can all be unraveled. No matter how tangled, confused, unworkable the piece becomes it can always be fixed. Because it is one long, uncut piece of yarn it can be “unknit.” If it tangles it can be untangled. Life can feel too much like a messy piece of knitted work. There are moments when you think that you cannot go on. It can never be made right. Life leaves scars. Knitting does not. Knitting can be undone and remade exactly right. As a recovering perfectionist I do not remove all my mistakes. Unless it will alter the usability of the item, or leave a hole, I leave my mistakes in and simply correct the row in which I found the error. In quilting there is a concept of the “humility block” where if the piece would otherwise be prefect they add a mistake to remember that we are only human. I regard the slight imperfections in my work as signs of the fact that while I am flawed I am made and loved by a perfect God. Nothing can happen to me that God cannot help me to redeem. 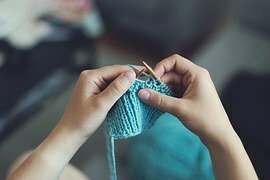 In Romans 8:28, St. Paul reminds us that, “And we know that all things work together for good for those who love God and are called according to His purpose.” In my tangles I feel confident in my ability as a knitter of many years experience that I can repair the problem and move on. Both the repair and the moving on are important parts of the crisis redemption. In life the same process must be undertaken. Sometimes I must unknit in order to create something new. Always I need to undertake the process of remaking in light of the pattern. What was the purpose in the first place? Look at the big picture. What does the finished garment look like? How can you get back to the appropriate pattern? I have never had anyone else able to find my corrections when the garment is finished. Even the worst mistakes can be worked out with a ball of yarn. It can be twisted and pulled into an amazing array of items. The longer you work at it the easier it becomes to unravel mistakes. What should I knit next? Do any of you readers have suggestions for something that could be made with one skein and might be of some use with a hat? Today I am linking up with Holley Gerth and Coffee for Your Soul. What encourages you to keep going when things are rough? How can you use that experience to encourage others to hold on to Jesus when life unravels?